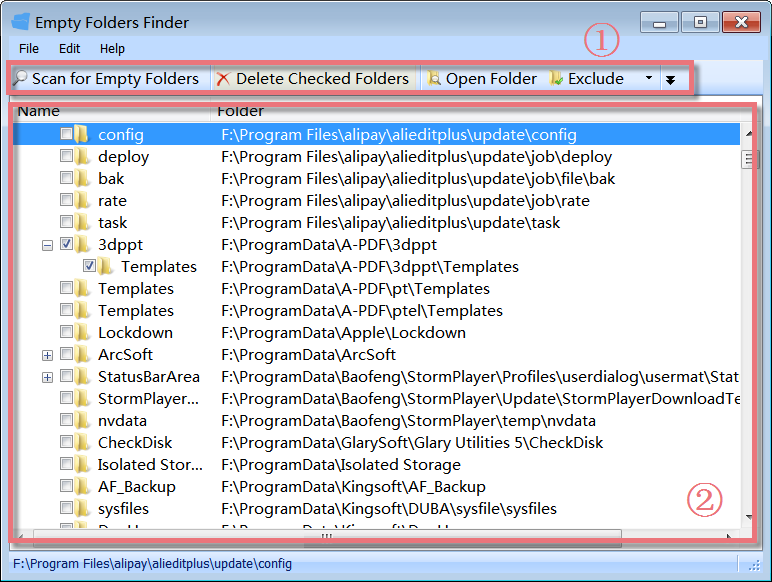 Glary Utilities 'Empty Folders Finder' is a freeware tool which finds empty folders quickly, allows you to open folder for a preview of its contents, and gives you the option to delete those folders to the Recycle Bin. 1.The Second Line Button: quick access button to Scan for Empty Folders, Delete Checked Folders, Open Folder and add the selected folders to Exclude folder list. 2.The Large Box: displays the empty folders with the name and full path of the folder. Empty Folders Finder can scan all parts of a disk for the empty folders. It offers a quick and effective way to scan the files from local disks or folders and will show you a list of files on the drive. Just click "Scan for Empty Folders" and a box will pop up, which allows you to choose all drives or individual drives or a folder you want to scan, and then click on "Scan Now" button, all empty folders will be showed at once. After scanning the local drives, you can see how many empty folders occupy your hard disk. If those empty folders are system folders, you needn't remove them at all. Our recommendation is not to remove. If the empty folders were created by yourself for storing files and then you actually haven't put any files in them, then you'd better remove them. Just mark the box before the empty folders you want to delete, click "Delete Checked Folders" to remove the empty folders from your disk. Empty Folders Finder can auto backup the empty folders that you have deleted. 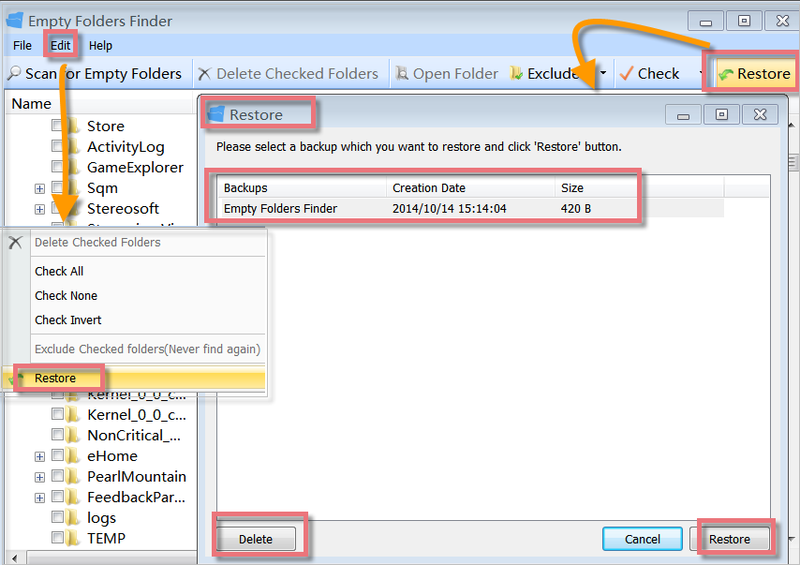 In case you have deleted some empty system folders, you can use "Restore" feature to recover them. You can quickly restore deleted empty folders with Empty Folders Finder. First find "Restore" from "Edit" menu on the first line button or click "Restore" button from the second line button, and then you need to choose the backups you want to restore, finally click "Restore" in the lower right corner. Empty Folders Finder offers a great feature that can check more than one empty folders group at a time to save you much time on checking empty folders. Just click "Check", it can help to check all the empty folders at once. If you want to check all folders, check none or check invert, just click an inverted black triangle symbol beside "Check" or click "Edit" menu on the first line button. 1. Click 'Scan for empty folders'. 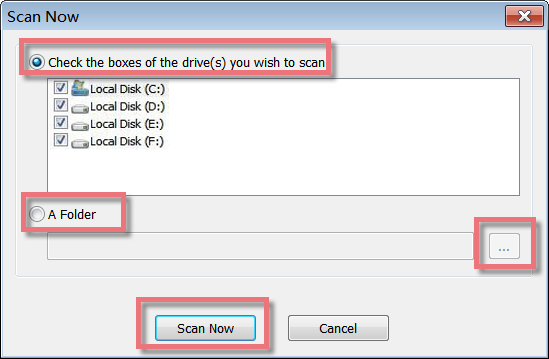 Select the drives you want to scan, by checking the appropriate drives. 2. Click the 'Scan Now' button and wait for the process to complete. You can cancel the scanning process by pressing the cancel Button. 3. From the list of empty folders presented, you can select those that you want to delete by checking them. You can also ignore the folder while scanning by clicking 'Exclude this folder(Never find again)' from Edit menu or on the Second Line Button. Select the folders and right click on them to see a context menu. The various options given are self-explanatory. 4. Click 'Delete checked folders' to send all selected empty folders to the Recycle Bin. Click "Remove empty folders" under Disk Space, Empty Folders Finder will pop up. Find and click Empty Folders Finder icon, Empty Folders Finder will appear. Please note: if you want to add Empty Folders Finder in the Dock bar, click in Dock bar, remove any icon by dragging it out of the Dock firstly, and then drag Empty Folders Finder in.